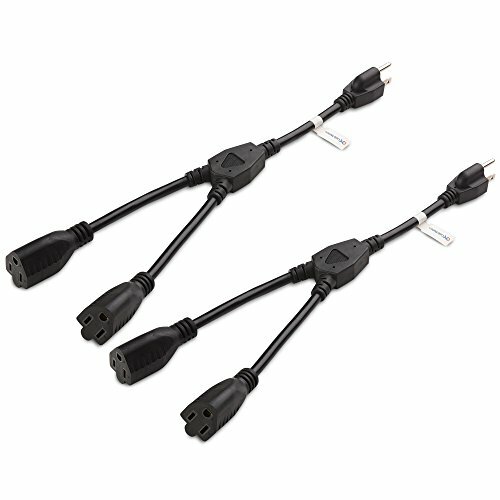 The Cable Matters 2-Outlet AC Power Cord Y-Splitter Cord creates an additional grounded outlet for connecting devices to a UPS or wall outlet. The cost-effective 2-Pack provides a spare power cord to keep in your toolkit or garage. The combination of 16 AWG gauge conductors, a 13 amp/1625 Watt rating, and connectors with molded strain relief provides a safe and reliable Y-splitter power cord cord. A lifetime warranty is included with this power cord for peace of mind when purchasing.